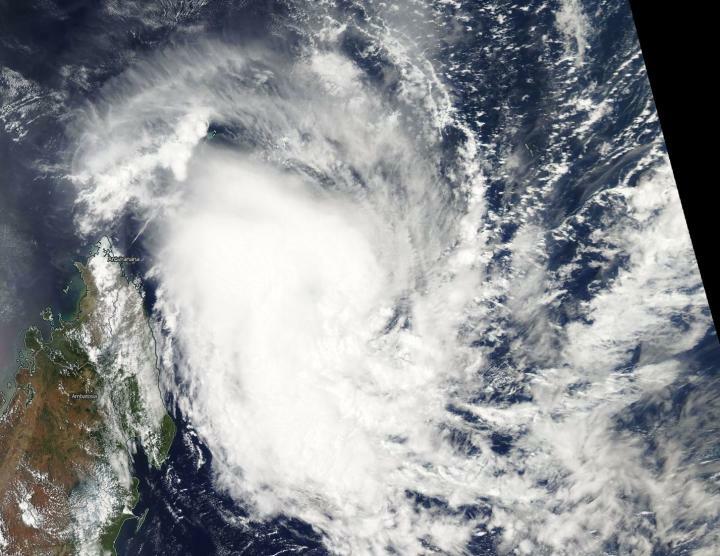 Tropical Cyclone Alcide continued to linger just northeast of the Island nation of Madagascar in the Southern Indian Ocean when NASA's Aqua satellite passed overhead and captured an image of the storm. On Nov. 9 the Moderate Resolution Imaging Spectroradiometer or MODIS instrument aboard NASA's Aqua satellite provided a visible light image of the storm. The MODIS image showed a somewhat elongated storm from northwest to southeast with the bulk of clouds in the western quadrant of the storm. On Nov. 9 at 10 a.m. EST (1500 UTC), Alcide's maximum sustained winds had dropped to 80 mph (70 knots/129.6 kph). It was located approximately 487 nautical miles north-northwest of Port Louis, Mauritius. Alcide is moving southward at 1.1 mph (1 knot1.8 kph) and is expected to curve to the northwest. Because of the storm's slow movement, it is bringing up cooler waters from below the ocean's surface, which will in turn, weaken the storm.